Los Angeles Kings center Anze Kopitar, left, collides with Colorado Avalanche defenseman Samuel Girard as they pursue the puck in the second period Thursday in Denver. 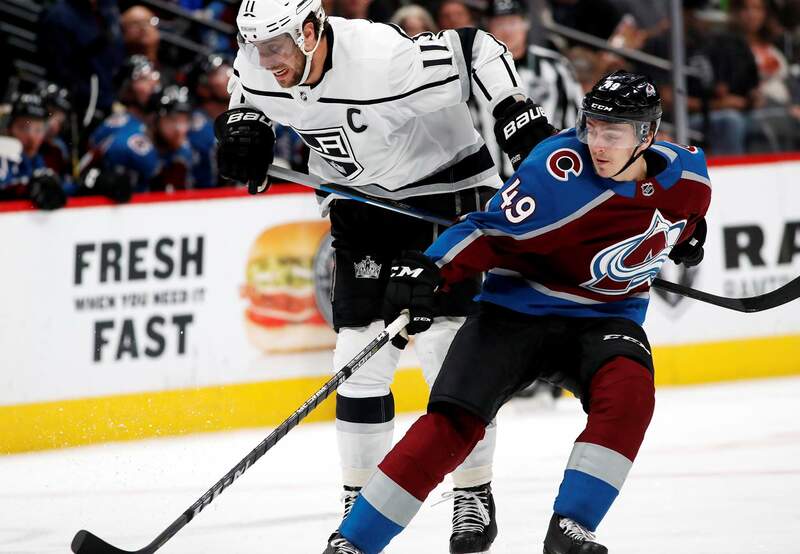 DENVER – Anze Kopitar became the first Kings player with a four-goal game since 1993, Jonathan Quick stopped 29 shots and Los Angeles picked up another valuable road win by cruising past the Colorado Avalanche 7-1 on Thursday night. Tobias Rieder had two goals and Jake Muzzin scored his first goal since Feb. 3 for the Kings, who surpassed Anaheim for the third spot in the Pacific Division. Los Angeles improved to 6-0-2 over its last eight road games. The Kings beat an Avalanche team that’s 15-3-1 in its last 19 games on home ice. Colorado remains in a wild-card spot with eight games remaining. Semyon Varlamov showed signs of fatigue in giving up five goals before being replaced by backup Jonathan Bernier in the second period. Varlamov has appeared in 19 straight games (16 starts) with Bernier sidelined by a concussion. Bernier returned Thursday and allowed two goals. It’s the third time this season the Avs have allowed seven goals. That all but wrapped things up. Kopitar recorded his first hat trick since Feb. 12, 2016, with a backhander in the second period. Some of the fans at the Pepsi Center littered the ice with hats. He wasn’t done there, though, scoring his fourth on a breakaway. It was certainly the Kopitar Show in the first period, with the Avalanche struggling to cover him. At 30, the Kings captain is having his best statistical season with 86 points. Quick was credited with his fourth assist of the season on Rieder’s goal. Avs forward Carl Soderberg missed a second consecutive game with an illness. Defenseman Tyson Barrie had his 11-game point streak snapped. Colorado will host Las Vegas on Saturday.